A few weeks ago, Sasha wrote a great article about where to find books for less. The post generated so much discussion and suggestions I had to dig into it some more. 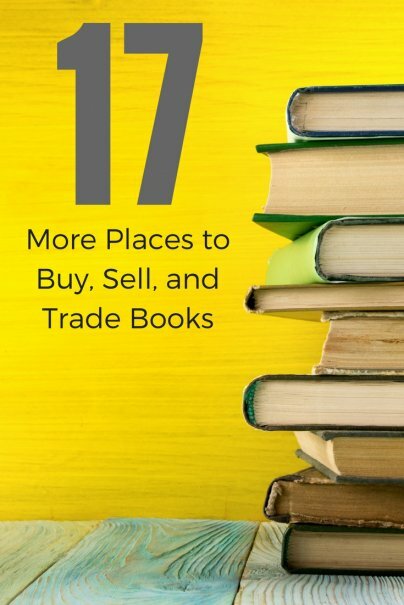 Here are 17 more places to buy, sell, or trade books. Out with the old, in with the new. Swap books with other bookworms online. PaperBack Swap lets you trade your books with others online. Post the books you are willing to swap. Credits for sending books to members who request them. Then use your credits to buy books from other members. All you pay is the postage to send your books to members. With over 3,000 members and 4 millions books, you're sure to make a suitable trade. BookMooch also uses a trade-for-points system. Get points when you send a book requested by another member. Use those points to request books for yourself. Give books away. Get books you want. It's that simple. Swaptree allows you to trade all sorts of things, like books, music, movies, and games. The best part is they match your trades for you. Their super smart algorithm instantly shows you thousands of items you could receive in trade for any item. Bookins is another full-service swap site that arranges the swapping for you. They arrange the trade. Get points for your trade-in and request your trade-out. You don't need to deal directly with other traders. Novel Action allows you to trade without having to wait for someone to select your book. Select any books you want and send them an equal number of your books in exchange. Just pay the flat rate shipping and your exchanges are shipped to you once your books are received. Don't have any books you're willing to part with? Check out these sites to buy new, used, or rare, for less! Alibris offers a large selection (100 million titles) of used, new, out-of-print, and hard-to-find books from their large warehouse or in their network of indie booksellers. AbeBooks connects thousands of professional booksellers that offer rare, new, and used books. A1Books partners with the top ten major wholesalers and distributors to offer books, media, games, and electronics. Overstock is better known for their rock bottom prices on clothing and home accessories, but they also has a large selection of books on sale. Amazon usually has a good discount on all their books, but their marketplace lets any vendor to compete and offer the same book, used or new. Look for the "More Buying Choices" link to see available offers for any given book. eBay is always a good stopping place when bargain hunting. Don't forget that oftentimes sellers may want to unload an entire collection of books. Make sure to drop by and do a search for your favorite authors and genres to see if there are any bulk offerings. HamiltonBook offers new books at discounted rates. Most books are closeouts or overstocks, but there are also current titles at special prices. BookFinder lets you compare prices across many sites for any particular book. Enter the title or ISBN number of the book you're looking for and get a list of all available sellers across various vendors and sites. Want to just get some cash for your books? Besides listing them on Amazon and eBay, these are great places to sell your books, too! CKY Books offers instant quotes on your books. Enter the ISBN number and get offers right away. Get paid with PayPal or check and pay zero in shipping costs. Cash4Books also offers free shipping and fast payment. Blue Rectangle will buy your books as well as DVDs. They also have a ton of book reviews by their users. BookScouter tells you which site will give you the very best price for your book! Half.com (affiliated with eBay, of course) and isbn.com. I use isbn.com whenever I shop for textbooks. It generates a list of online book sellers and lets you know which one are the cheapest. It costs 7 bucks in Canada to send a book by mail. It is way cheaper to throw out your book and then buy a different book at Costco or the used book store. I give away my old books. I guess the people who hang around me get the best deal. hi--Thanks for pointing our story out to Wisebread readers! We have many more tips for saving money and time over at http://blog.learnvest.com and www.learnvest.com. So honored that we were mentioned by a Wisebread commenter--Wisebread is a great site with a smart community. Bookmatchers is a great up and coming site to trade books. It's sort of new now, but with more people joining, networks can be created on their campuses. In addition to just books, collegematchers is a craigslist for colleges across America. I love to sell on Amazon its so simple you can upload a book in 30 seconds and is great for selling them quickly. Seriously recommend it, even to a beginner. I like Paperbackswap although I haven't used the others. I think it is a great way to get books. Mailing the book usually costs between 2 and 4 dollars. Their are several advantages to paperbackswap over a used book store. For example, you get even credit for the books you swap and you can wish for a book not currently in listed. Other things I like about the site is that it is easy to list your book, it tracks what books you received for easy re-posting and you can keep track of which books you are thinking of getting. Also I'm not good at returning my books to the library on time so it is nice not to pay late fees. I've always used www.Gettextbooks.com to find the best deals on textbooks, great comparison site. I have both bought and sold textbooks through them, and have been thrilled by the experience every time. I've also bought numerous other types of books from them, but I like to mention textbooks since they're so expensive. I consistently get the best textbook sell-back prices through them, and the textbooks they sell are usually way cheaper than anyone else, or right around the Amazon price. Plus every purchase supports world literacy. I've written a bit on this. You can also sell to powells.com. Chegg.com rents books, but will also buy current textbooks--often for as much as you can sell them for. Ditto for bn.com (Barnes and Noble). You need to compare for both buying and selling. There's no one best place to do it. For instance, I had an extra copy of a book that was worth a penny on amazon; since it (a novel) is used in courses, Barnes and Noble gave me $1.80. Easy to pack up a bunch of books and mail. BN, Chegg, and Powells all pay shipping by the way. BN.com has a minimum of $10.00 for their buyback and Powells has, I beleive, $5.00. Don't forget Better World Books! Great prices on textbooks (as well as popular fiction). Great bargains in the Bargain (5 books for $15) and it's free shipping anywhere in the U.S.
Also, as Cam said, all purchases support global literacy. I get used books cheap all the time here. the best place for used books. another site http://sellit2us.com that buys not only books but CDs, DVDs Video games and Software. You might make more on eBay but this would be a lot easier. Personally I am a fan of CKY Books I sell all my used books there and then donate the books they arent't buying for a tax write-off. I like to buy books at Biblio.com. They have used, rare and out-of-print books, which is really cool. Plus they offset carbon emissions on your book shipment, which is important to me. You can't sell or trade there, but there's some really awesome rare books. Plus they're just an ethical company. One not listed is dealoz.com. They list all the ones listed here and more! They are a great one-stop resource! you didn't mention my favorite: www.BargainBookMole.org: it's way faster than the most popular price-checking websites for books; also has free browser add-ons that let you ck prices for used and new books quickly and easily on the fly, from any website. I am an avid buyer of books online and one site that I have found that I liked was http://www.powells.com/ They are a brick and mortar independent bookstore (which I love to support) located in Oregon. Powells has used books as low as $1.00 plus new and ebooks/digital editions and shipping is reasonable as well for those purchases made online. Powells will also buy books online for cash or trade. Great site and great selection! Swaptree.com is now Swap.com. You now must list a credit card with them and pay fees related to trades/shipping. I Found a new one. If I remember correctly it is called kosta's list worldwide. It is a forum actually and it sell other types of stuff as well. But it allows auction type of listings as well. Another great option would be to try http://bookquoter.com you can compare book prices and get the best value for all of your book needs. What I think is really important when buying used textbooks is to compare the prices of the different websites. There are so many different sites that offer different prices that you need to get an overview of the best prices to be sure that you can save more money when buying used textbooks. To get the best price I always use Bonavendi.com. It is really a cool comparison site and very easy to handle. I definitely recommend Amazon for trading in your books for cash. What about romance novels. And they have e no front cover they were ripped off. The book is brand new straight out of the store but beings they couldn't. sell it all the covers were ripped off. But the book itself is in excellent condition,with title and the author on the side and pages never toched beside by my very own hands.